There is a sequel of a legend supported by real facts and defined in the adventure novel “His majesty the cat” by French writer Marcet Baudoin-Crevoisier, a man loving Birmans and their breeder. This novel describes possible origin of Birmans in Europe. The version is that an American millionaire travelling in the far East, Mr. Vanderbilt sent those cats to France. Birmans are ideal family cats. Today Birmans considered as an elite breed. They differ from other breeds by their appearance, charm and character. Birmans become part of family very quickly, they have good deal with children because of their social nature. Birmans are loving animals who may prefer to sit beside their human, lay upon their human’s lap or sit on their human’s head at 4 o’clock in the morning! Generally a soft spoken cat, a Birman will let you know when attention is needed. They need your love and personal contact. These cats are very curious and pay your attention when you’re doing a homework. Birmans are also very sociable with your guests. “When I’m asked. 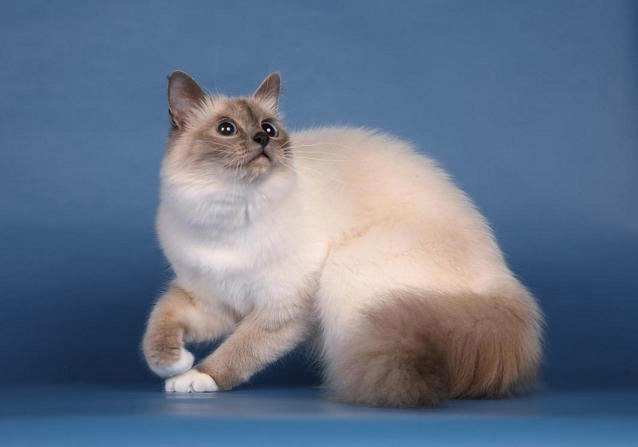 What breed to choose, I often advise to choose Birman because of its exclusive features. Birman is very sociable, likes children, takes part in family life: by character perhaps the best breed for family” – Madeline Boyer, French breeder. “They are differ from the other breeds in communication: quiet, not obtrusive and may speak anly by look” – Julia Ferry – Italian breeder. Sacred Birmans are the brilliant achievement of French breeders. Sacred Cat of Burma is a fine breed cat with a fascinating appearance. Its magnetic look, sweet expression and charming appearance are due to a rigorous standard which make selecting this breed very difficult. The main feature distinguishing this breed from the others is the presence of gloves, the fingers of all paws have white fur. It’s the only white part of the body. “Perfect” gloves are difficult to obtain in kittens even though their parents are within upper and lover limits. This makes the breeding of show quality cats even more difficult. Beside the gene responsible for white fur may bring tufts of white fur also on other parts of body. Birman is very rare breed in Russia. They are not well known here. So, we hope that Sacred Birmans Club will appear in Russia soon.